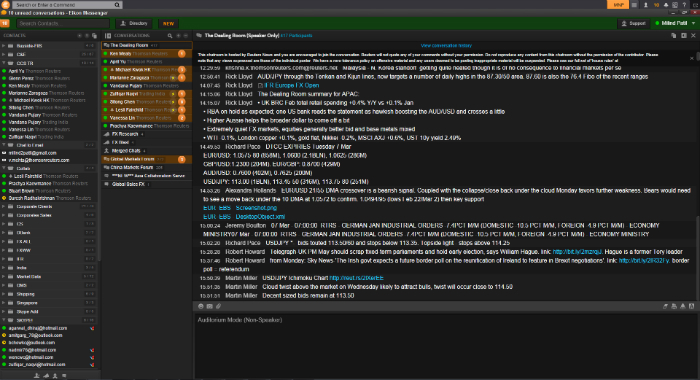 The Dealing Room is an exclusive community forum for FX and Money Market professionals operating on Thomson Reuters Eikon Messenger. Full of top policy makers, peer groups, client and professional commentators, the forum surfaces the most critical market topics, the widest range of views, and hosts the most influential guest voices, in real-time. The Dealing Room offers content, conversation and networking all in one place. Real-time views from blue-chip minds are drawn from the financial markets, Reuters newsroom, policy leaders, and academia. Join The Dealing Room to hear peer opinion and voice your own thoughts. Members and editors jointly collate the most interesting views about current FX and money market topics to save you time. Reuters is renowned for breaking news. Our editors will highlight the main stories of the day, what they mean, and what you can expect next. We’ll keep you abreast of key developments and you will see in real-time how your peers are reacting to the same story. Reuters editorial-led forums are carefully moderated community forums led by a Reuters editor or analyst. The forums are invitation only and participants from many banks and organizations have joined them because they have a critically important ingredient – active management by trusted members of Reuters editorial staff. Access to The Dealing Room is exclusively offered to Eikon, FXT and FXAll subscribers. If you have access to any of these services, please click YES to the question below and complete the form to register your interest to join the forum. Your personal information will be used for the purposes of reviewing your request to join an Eikon Messenger forum. If your request is successful you will be subscribed to the requested forum. We need your consent I agree to my data being used to process my forum request.